Collectively and consistently, participants’ responses point to seven straightforward factors that impact the results of a change initiative. Below are the best practices of change management, as reported to Prosci by over 6,000 change practitioners over the past twenty years. Research participants who identified these contributors were experienced practitioners, project leaders, executives and consultants. 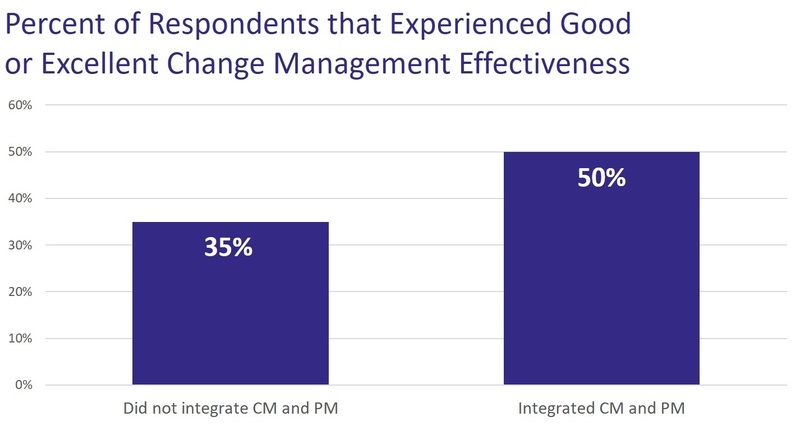 Over 70% of participants in the 2016 edition of Best Practices in Change Management had more than four years of involvement in applying change management, and almost one third had more than twelve years. 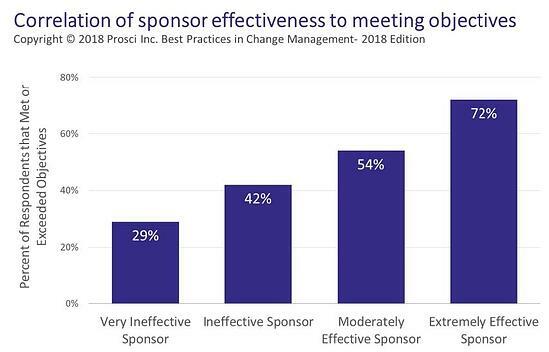 The graph below shows that with extremely effective sponsorship, projects were almost three times more likely to meet or exceed project objectives than projects with very ineffective sponsorship. If you are not sure how to help your sponsor become active and visible - or if you are a sponsor and are not sure what “active and visible” means - read this article on a sponsor’s role. One participant provided this insightful comment: “If it isn’t someone’s job, then it’s no one’s job.” To realize the benefits of change management, someone must be responsible for it and have access to an appropriate amount of funding. 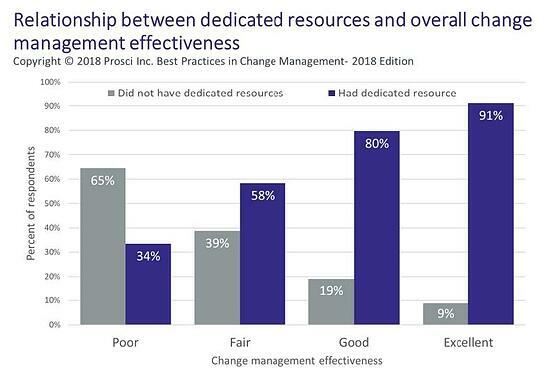 The data revealed a positive and meaningful correlation between having a dedicated resource (person) and overall change management effectiveness. 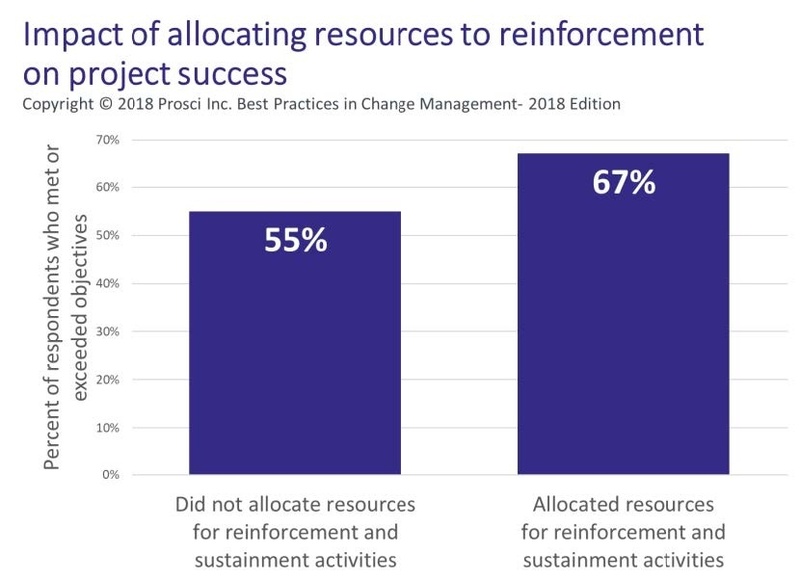 Participants that had dedicated resources were significantly more likely to have good or excellent change management effectiveness than those without a dedicated resource. How organizations used a structured approach varied in the research. Seventy-nine percent used a change management methodology for general guidance while 48% used it as a checklist for activities and 39% used it to monitor progress (participants were able to select multiple responses, resulting in a total of more than 100%). Again, the research revealed just how much applying a structured approach contributed to success. 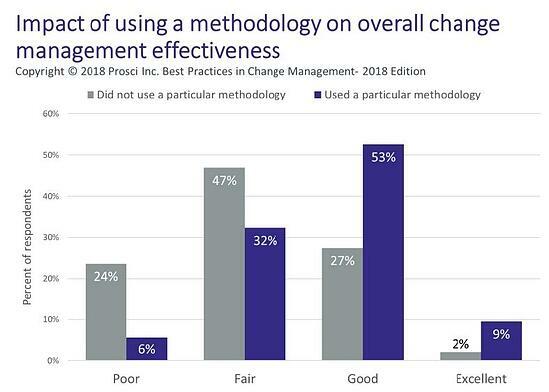 Participants that applied a structured approach were 33% more likely to experience good or excellent change management effectiveness than those without a methodology. The goal of these efforts is to build an employee base that demonstrates a willingness to participate in the change and collaborates with the people administrating the change. Reinforcement is a critical step in the change management process. Because organizations are heavily saturated with change, this step is often neglected as practitioners juggle managing multiple changes. Inadequately addressing reinforcement and sustainment activities has a negative impact on the overall outcome of the change. Participants that planned for reinforcement activities were 12% more likely to achieve project objectives than those that did not. Additionally, participants identified important topics to communicate such as why the change was happening, expectations, long-term plan perspectives, how the change will impact employees, and essential business drivers. More and more organizations are realizing the value of integrating project management and change management. Participants who integrated these two disciplines were 16% more likely to meet or exceed project objectives than those who did not integrate. 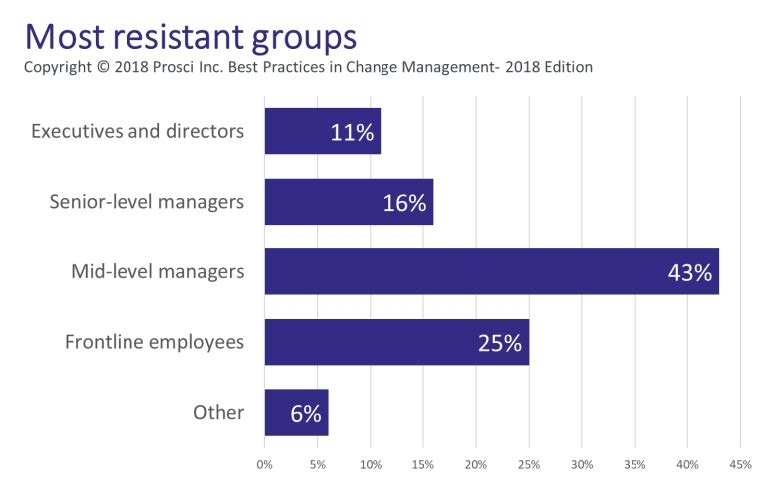 Middle managers were revealed as the most resistant group in Prosci’s research, with 43% of participants identifying managers as the group most resistant to change. Participants believed a majority of the resistance experienced by managers could have been avoided. By thoroughly addressing this group in the change plan, resistance can be mitigated and managers will be able to drive change.